NEW YORK (AP) Mike Conley ended the Nets’ hopes of a comeback. The Nets had trimmed the Grizzlies’ 16-point lead to 99-92 on Rondae Hollis-Jefferson’s dunk with 3:55 left. 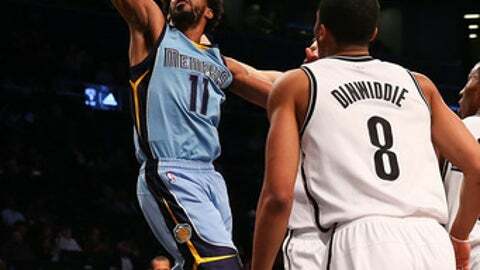 However, Conley scored Memphis’ next nine points and then the final two to clinch the victory. The Grizzlies closed the first quarter on a 10-0 run and took the lead for good. They scored seven straight in the second quarter and took a 52-42 lead into halftime. Memphis pushed it to 70-55 on JaMychal Green’s jumper with 5:58 left in the period. The Grizzlies led 79-72 after three and Brooklyn got no closer than five again. Green finished with 10 points. Sean Kilpatrick added 15 points for Brooklyn and Trevor Booker and Hollis-Jefferson each had 13. Grizzlies: Starter Tony Allen did not play because of a ”planned recovery day,” according to the team. James Ennis III started in his place. . Memphis is 16-13 on the road this season, but only 5-7 against Eastern Conference teams. … The Grizzlies own the third-longest active streak among all NBA teams with six consecutive winning seasons and playoff appearances. Only the Spurs (20 straight) and Hawks (9) have longer streaks. Nets: Brooklyn has lost to the Grizzlies five straight times. The Nets have not won a game in the series since March 5, 2014, a 103-94 victory in Brooklyn. … Dinwiddie’s 17 points were a season high. The Nets’ 15 straight home losses are a new franchise record. The New Jersey Nets lost 14 straight at home during the 2009-10 season. Brooklyn has not won at home since Dec. 26 against the Hornets (120-118). Carter, who turned 40 on Jan. 26, is the oldest player in the NBA. Now in his third year with the Grizzlies, Carter was a member of the New Jersey Nets for five seasons (2004-09). He is still third on the franchise’s scoring list (8,834 points), right behind Lopez (9,928). Grizzlies: Memphis hosts New Orleans on Wednesday. The Grizzlies have won both meetings this season, both in overtime.